Do empaths have stronger physical reflexes and a startle response? 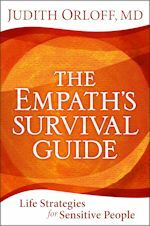 Answer: It can be a revelation to find out that you are an empath when you take the quiz in my book, The Empath’s Survival Guide. Yes, I’ve seen that empaths have very sensitive physical reflexes and a quick startle response. As an empath, I notice this in myself and many of my patients have reported this. On a physical level, empaths are highly sensitive people with a highly sensitive nervous system. That’s why it’s important to learn how to calm yourself with meditation, exercise, being in nature and quiet contemplation as well as not to over-do social activity. It’s vital to learning how to listen to your body and set clear boundaries with people or situations that are draining. It may sometimes be awkward to set healthy boundaries with negative or draining people, but it is an important skill to learn. If someone has unrealistic expectations of you or unable to respect your feelings remember “No” is a complete sentence. The key to setting boundaries is to come from a centered, unemotional, place—not to be reactive.